The usual DDR3 voltages for 24/7 are anything up to 1.725V actual(checked with DMM). For benching I wouldn't go above 1.85V on air cooling but if but if the sticks scale well with voltage 1.9V is still reasonable depending on what sticks you have. With AMD chips the north bridge plays an important role in just how high clocks you can run so once going above DDR3 2400 you will need to raise the voltage. For 24/7 on 32nm and 28nm CPUs stay below 1.35V and for benching stay bellow 1.4V. The primaries behave like primaries on intel and depend entirely on your kit of RAM. You can run lower ones with more voltage. The Secondary timings have a massive impact on how high you can clock your RAM. Higher numbers will usually yield higher clocks but going to far will make your system unbootable so do not just max all of them out lower timings will get you more performance for a set frequency. A free timing is a timing that you can adjust independently from all the other timings without losing stability for any other reason than being too low. Settings: 240ohms 120ohms 80ohms 60ohms. Lower on die termination allows running higher frequencies. 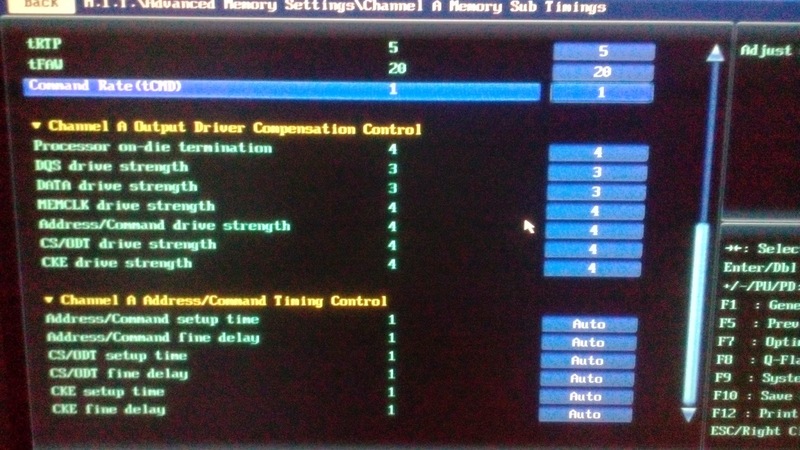 Higher drive strengths allow higher clocks and lower timings. The DQS and DATA drive strengths top out at 1.25x for me regardless of what I do. I set all the other settings to the absolute maximum of either 2x or 1.5x. I do not have any pictures because different motherboards have different timing table layouts so you'll just have to read them all anyway.